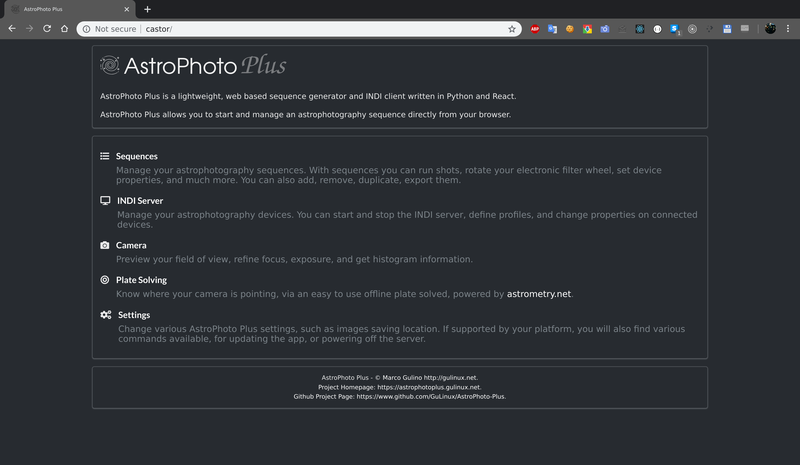 AstroPhoto Plus allows you to start and manage an astrophotography sequence directly from your browser. You can install the web server on any GNU/Linux powered device, either a laptop, a compute stick, or one of the now very popular SoC boards such as the Raspberry Pi. Also allows to execute commands on server, temporarily pause sequences, or change any INDI device properties. Camera preview page: you can preview your camera field, focus, and check for exposure. Plate solving: find your what coordinates you're pointing to using astrometry.net offline solver.